Let us show what Viima can do to help you make more innovation happen. Viima helps you go from ideas to innovations, every step of the way. It's the all-in-one innovation platform that scales with your needs. Let us give you a brief tour of what Viima can do for you. Ideas aren't tied to your desk, neither is Viima. Did you know that 97% of people get their best ideas outside the office? Thus, your ideation tool has to be easily and effortlessly usable wherever you go. No need to worry, Viima will be there with you. 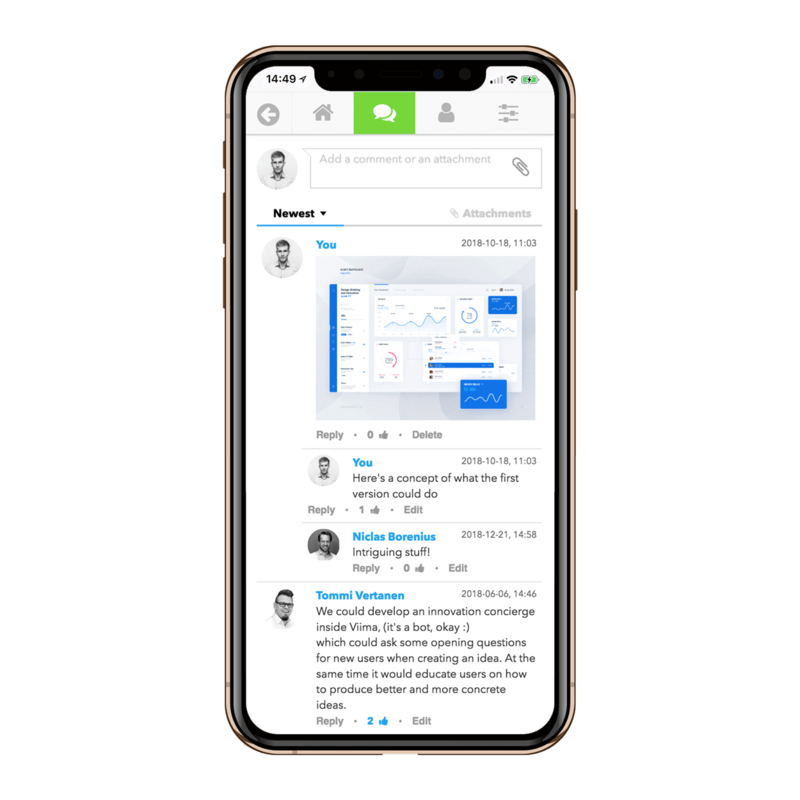 Our mobile apps make it easy to document your ideas, upload photos and videos while on the go, as well as quickly weigh in on active discussions. Enterprise-grade reliability, security and flexibility. Enterprise software is often quite stuffy, but it doesn't have to. Viima was designed to be super easy and engaging to use, while still being enterprise-grade. As a result, people love using it. Our board based design allows you to flexibly adapt to your every ideation need without IT support. We've got you covered with adjustable appearance, fine-grained control over features, flexible user management and easy integrations, including all the most common Single Sign-On (SSO) methods. Viima scales all the way from small teams to the Global Fortune 500. Have thousands of users and hundreds of varying ideation needs? No problem. Viima adapts as your innovation operations grow. Our enterprise plan has custom agreements, volume discounts and even more control over aspects such as security, privacy and service levels. We follow industry standards and best practices and have been audited by a number of third parties. We rely solely on trusted and audited service providers in our infrastructure and you always own and control your data. We are also fully GDPR compliant. We worry about security so that you can focus more on making innovation happen.